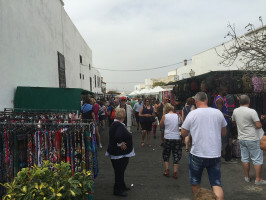 Take a morning off to delve into one of the most interesting markets on Lanzarote, the market of Teguise. This half-day tour is the ideal way to start another perfect day in paradise. Hop onto our comfortable coach for a brief drive towards the picturesque village of Teguise, where you will surely fall in love with the local charm and panorama. Located only 20 kilometres away from Arrecife, such is the change of scenery that awaits you a mere half-hour ride away from one of the main cultural and tourism centres in the island. 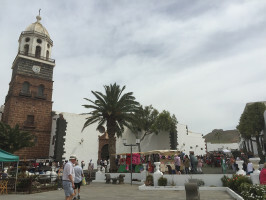 Teguise’s famous market, which attracts locals from all corners of Lanzarote, is held every Sunday with religious punctuality. You will see the usually quiet streets bloom into an animated street market. 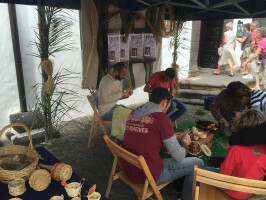 It will soon become apparent why this is one of the most important markets in the Canary Islands; in its countless stalls you can find everything from handicrafts, pottery, leather goods and even a wide array of fine natural produce, including cheeses, wines and cacti and aloe vera products. You will also happen upon many street artists selling their creations. If you are in the mood, you can even enjoy some live folk music and dance at the Plaza de los Leones, an amazing experience that will brighten up your day. 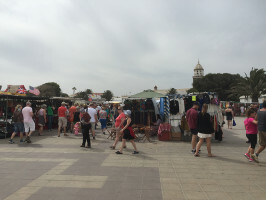 Bargain lovers can shop ‘til they drop at the Plaza del Pueblo Marinero; live a true Canary experience that will leave you ready to tackle the rest of the day with renewed joie de vivre. Spanish, English French, German and Dutch.